I just love these quick and easy Christmas cards as they look stunning and take a matter of minutes to make! For those of you who are none believers, I kid you not, a lady at the recent Ross Papercrafts show timed me as she didn't believe I could make a card (any size!) in less than 3 minutes, well these beauties take just over two minutes to stamp and assemble!!!!! Start by cutting your all your card to size for an 8 inch square card you will need: 8 inch square cream base card, 7 1/2 inch square piece of coloured card for the mat (same colour as your ink) and a 7 inch square piece of cream card. Next create your template, to make mine I drew around a festive chipboard shape and cut it out. Alternatively you could use your festive die cuts or masks. Then attach the template to the 7 inch square piece of cream card using low tack tape. Using the cog arrangement stamp from the Mini Cog Corners stamp set "fill in" the template, making sure you over stamp on all the edges. When you are happy you have filled the template, remove it carefully. In each corner stamp the corner stamp. And mount it onto the 7 1/2 inch square coloured piece of card. Around the edge of the 8 inch square card stamp the small cog arrangement, when stamping make sure some of the image is stamped off the card. To finish off the card attached the mounted coloured card onto the base card. The cards look great left blank like this one or with added embellishments. 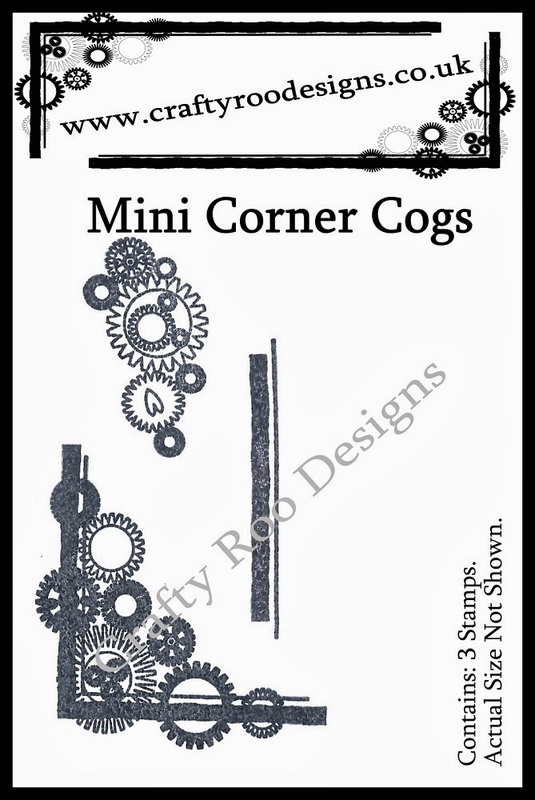 The stamp set used to make these cards is called Mini Cog Corners and is available from Crafty Roo Designs and is only £3.00 including P&P. Or you can buy the stamp set and 5 festive chipboard shapes to make your templates for £4.00. I used Distress Inks for these cards as I really like the Chipped Saphire (Blue), Age Maghogany (red) and Pine Needles (Green). But you can use any inks an it will work.